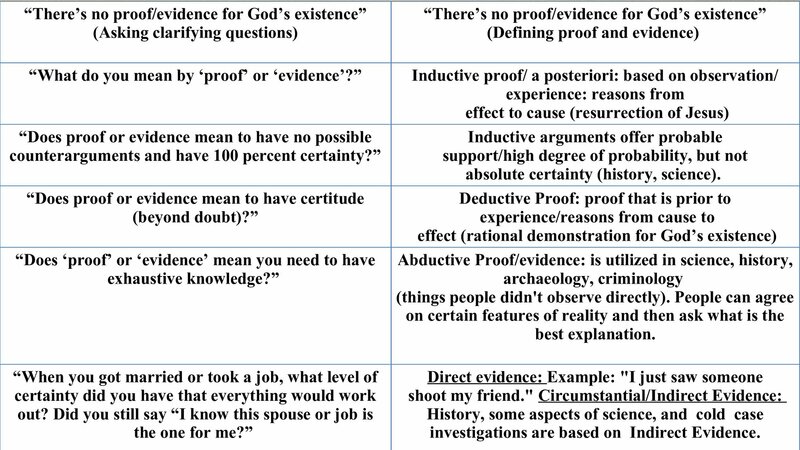 In this case, I always ask what the individual means by ‘proof’ or ‘evidence.’ I discuss some of the issues that are mentioned in the chart above. I also ask them what would convince them God exists. In most cases, they will generally respond three ways. They will say “I have never thought of that before?” Or, they will say they want scientific evidence. We will look at the science issue in point #3. They also may say that they think God should show them some sort of sign that He is real. 2. Religious Pluralism: “How do we know which religion is true?” When a student asks me this question, they generally assume it is impossible to navigate through all the different world religions and we simply can’t know if any of them are true. My response to this question is “How would we know any of them are true?” In other words, “What method would we use?” Furthermore, I always ask “If God exists, does it make sense he would speak somewhere within the course of human history?” This last question creates a plausibility condition. If the person says they do think it is plausible that God can reveal his plans and purpose for humanity within the context of human history, we can go forward and examine the evidence for each religious claim. 3. Science: I am never surprised to hear students tell me they want scientific evidence for God. In other words, they want what they call ‘observable’ or something they consider to be ‘testable.’ In response to this issue, I simply ask “What is science” and whether modern science is even set up to provide evidence for the existence of God. Allow me to give a definition of science: “Science the attempted objective study of the natural world/natural phenomena whose theories and explanations do not normally depart from the natural realm.”(Del Ratzsch,Philosophy of Science (Downers Grove, Ill.: InterVarsity Press, 1986), 15. If we are going by this definition, the nest question is,“Is God natural or non natural?” How would science ‘prove’ or provide evidence against the non-existence of God? For example, if God created the universe from nothing (think, Big Bang), then all naturalistic attempts to explain the universe’s beginning are going to run into problems! Now having said this, I think there there are traces of God’s fingerprints in the natural world. Can we observe God directly? No! But since science is a search or causes, we can observe the effects in the world and make rational inferences (i.e, is the cause of what we observe the result of natural causation or intelligent causation?) If the person is open to look a the evidence, then we can discuss issues such as biological information, molecular machines, or the universe. But here’s the kicker: even if we do have strong evidence for intelligent causation, that would only allow us to arrive at a deistic God or general theism. 4. “But there is no evidence Jesus never existed.” Sadly, many college students hear this objection and it still gets thrown around the university. I used to respond to this objection by providing several tests for the historicity of the New Testament. But now I simply ask the individual the following: “If there is good evidence that Jesus existed and rose from the dead, would you follow Him?” In many cases skeptics respond by saying “No!” Hence, I am under no obligation to spend an hour going over the basics of how we approach history and investigate someone in antiquity such as Jesus. 5. Pragmatism: The most popular view today seems to be a pragmatic view of truth. I see it everywhere! Many people tell me that all that matters is the benefit of a religious belief. In other words, if it makes a difference and helps someone is the test of truth. So what does this mean for us? Realistically speaking, I suppose Mormons can testify as to why Mormonism helps them have strong families. Black Muslims can testify in prison that Islam has helped them be more responsible. I could go on with more examples. Hence, many people are not asking whether it is objectively true. Comments like “I don’t see what difference Jesus would make in my life” and “I don’t think it is relevant whether God exists or Jesus is the Son of God” are somewhat common.This shouldn’t be surprising given our entire culture is built on pragmatism. After all, people go to college to get a job that will work for them and help them get a good job. Furthermore, the Church has been embracing pragmatism for a long time. Not much has changed. If I see students are lapsing into a pragmatic or subjective view of truth, I simply say “So the first question is whether the Christian story is actually true.” In other words, I just bring the person back around to the issue of objective truth. Believe it or not, many people say tell me that once they think about what I am saying it is clear that it does matter if Christianity is objectively true. How they feel about whether God exists or the resurrection of Jesus won’t change the fact as to whether it is objectively true and corresponds to reality. So I think it is incumbent upon me to explain what objective truth is and how the person can’t avoid it! There are many other objections on a college campus.Learning to ask the right questions can be a huge asset in your conversations with people. Press on! Next Article Is the Resurrection of Jesus a Qualification for Being the Jewish Messiah?